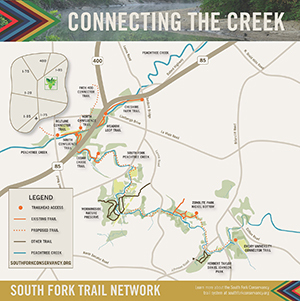 In 2008, the South Fork Conservancy (SFC) was formed to carry out the vision of connecting trails and neighborhoods along the South Fork of Peachtree Creek. Over the last eight years, we have built critical neighborhood support, recruited more than 2,000 donors and volunteers, and coordinated trail investments of more than $4 million. Our efforts have restored several miles of creek banks and acres of greenspace, creating a home where native plants and animals can thrive. Our mission is to restore, conserve, and connect the natural environment through the tributaries of the South Fork of Peachtree Creek. We use the creation and maintenance of low-impact trails along creek banks to encourage public access, recreation, and enjoyment of this critical watershed. By connecting neighborhoods, increasing access to the creek, and providing greenspace, SFC trails make a positive impact both as a recreational amenity for urban youth and as a force for increasing property values. Through thousands of volunteer hours, we have removed acres of English ivy, kudzu, and privet that once choked the landscape. Once the wild tangle of underbrush was removed, we worked with Trees Atlanta and local garden clubs to plant more than 1,500 native trees and 500 butterfly-friendly plants. Our efforts have restored several miles of creek banks, creating an urban oasis where native plants and animals can thrive but we still have more to do! 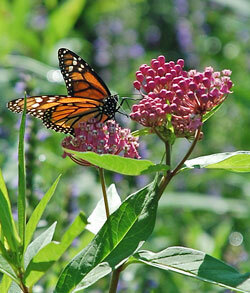 Please join us and help restore even more native habitat! The first phase of the South Fork Trail System Master Plan is to connect Buckhead with Emory University's campus. This connectivity to greenspace will enrich the lives of community members, enhance the livability of Atlanta, and add to the city's character. See an overview and maps of our breathtaking trail system. Visitors can stroll under the GA 400 ramp soaring high above, gaze at the creek from three beautiful bridges, and walk among old-growth and newly planted native trees. This trail is named for the Cheshire family who settled the area in the nineteenth century. This sunny trail meanders through 3.5 acres of butterfly-friendly plants along the creek’s North Fork and features Midtown Atlanta skyline views. The trail leads visitors along the creek to a clearing where native species are thriving. Native Americans gathered where the South and North Forks meet. Peachtree Creek officially starts at the confluence of these two streams. Today, visitors regularly see deer, otter, and a beaver family raising its kits beneath GA 400. Once an industrial brownfield, this area has been restored to a native meadow and wetland with a trail system. This greenspace is part of a wildlife corridor that includes Morningside Nature Preserve and Herbert Taylor-Daniel Johnson Park. Visitors particularly enjoy the low sandy banks and up-close views of the creek.